I love to workout (this was not always the case). I also love to eat. I talk about the next meal while inhaling the first. Before I joined Performance 360 I used to go to 24hr Fitness and walk on the treadmill and talk about food for what seemed like hours with my bestie Erin. From those talks I have gotten so many baking tips as well as recipes. 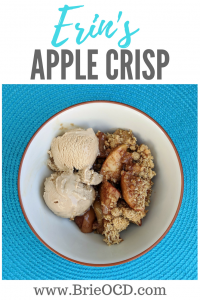 This delicious apple crisp is one of them!! 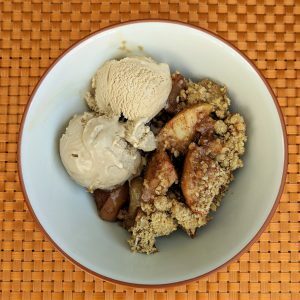 This apple crisp is a healthier version than your typical apple pie. Don’t kid yourself though, anything made with a stick of butter and sugar isn’t healthy. But like I said, it is a healthier version. I made this once for Christmas and now people request it every year. 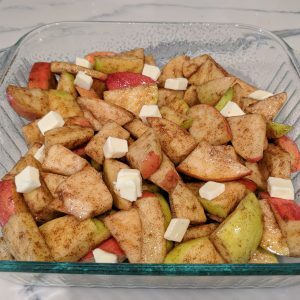 It is filled with apples, cinnamon, sugar, butter and oatmeal. In other words, its DELICIOUS. 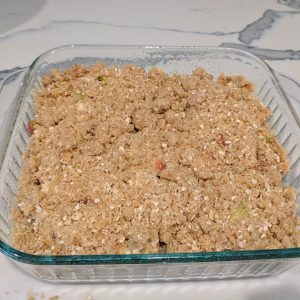 Instead of your typical pie crust, this recipe uses oatmeal cookie mix as the topping and is more similar to a “crisp” or “crumble” that you would order in a restaurant. 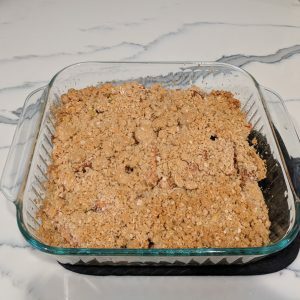 This recipe is super easy to make. Please Note: don’t make the oatmeal cookie mix according to the package instructions. 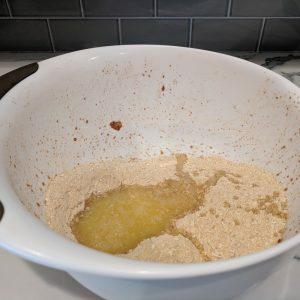 You use the mix dry (right out of the bag) and mix it with the remaining butter. I use the same mixing bowl for the entire recipe. This way you don’t waste all that cinnamon sugary goodness that was left from the apple mixture! I serve this with either vanilla or coffee ice cream (Dreyer’s Slow Churned is my go-to) depending on my audience. I hope you enjoy! Ingredients. I am missing the cinnamon! DOH! lightly grease 13x9 baking dish with cooking spray. 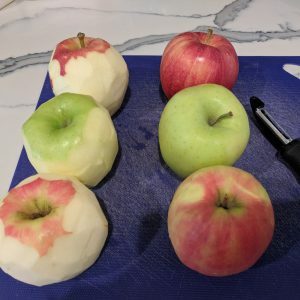 peel half of the apples. 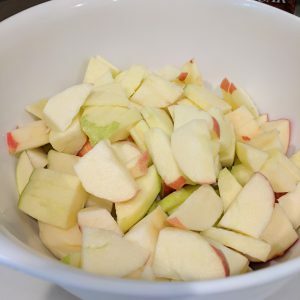 cut all of the apples into thumb size slices. (I slice and then cut in half). 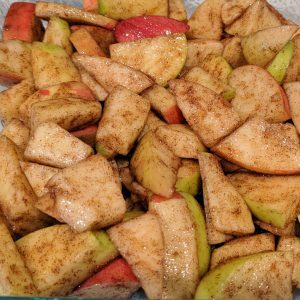 in a medium bowl mix apples with both sugars and cinnamon. stir for about 90 seconds. you will see the apples start to glisten. pour into 13x9 baking dish. do NOT rinse the bowl. 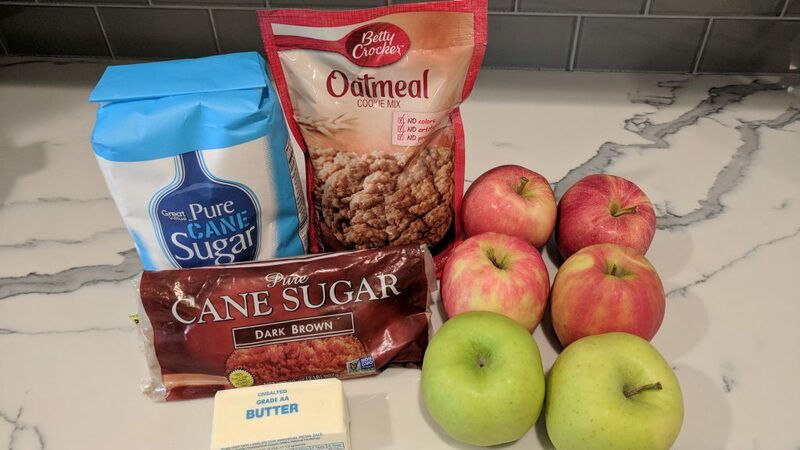 save to use in step 8.
cut 2 tbsp of butter into little squares and lay randomly on top of the apple mixture. melt remaining butter. grab same mixing bowl and add dry cookie mix and melted butter. stir. please note the mixture will be dry and a little lumpy. 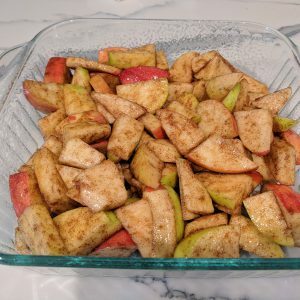 sprinkle mix on top of apples. Bake at 300 degrees for an hour. serve with light ice cream and enjoy!